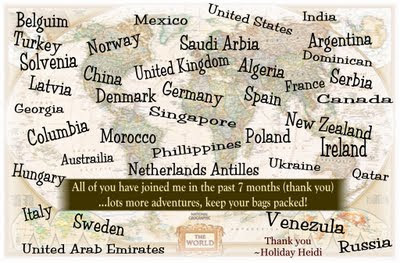 Today (the 8th of September) will mark the seventh month anniversary of when I started to bring you along on my travel adventures. I am humbled, surprised and excited at how much support and interest you have shown. I have posted a total of 21 blogs thus far (I try to post once per week). Those posts have been opened in 38 countries around the world and collectively viewed a total of 5535 times. I thank you. Blogger.com keeps a log of the statistics on my blog. They're complete with graphs, charts and percentages (all for free). I can check: "now, daily, weekly, monthly and all time" on things like "Overview, Posts, Traffic and Audience". I love following the stats, mainly for two reasons. One, because I'm curious to see who and from where. And second, because every time I check I am more astonished by what I see. While I have met a few of you from some of the places (all shown in the picture above), I don't have my own friends in each country listed (not yet anyhow). Thank you for sharing with your friends, I'm more than happy to bring them along on the adventure too!! 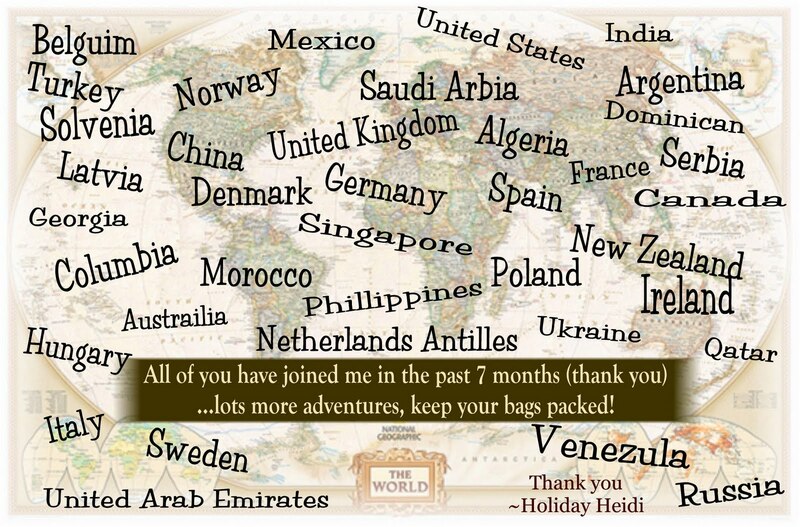 I will continue to write ... it's fun to know that you're packing your bags and coming with me! Feel free to answer this week's weekly survey question, leave a comment and/or send me an email: holidayheidi@hotmail.ca.